Easily the best client ever. Singer Sam Smith is looking mighty fine after losing 14 pounds in as many days. And to hear him tell it, it’s all due to a nutritional specialist named Amelia Freer. Freer is also the author of the book Eat. Nourish. Glow. that distills her philosophy down to 10 principles and includes recipes to get you on the right path. The book has been available in the UK. The photo above has about 147,000 likes. Interspersed with photos from his travels and daily life are pictures of foods he does eat, food he won’t (on Freer’s orders) and how his diligence — and her advice — are paying off. Smith just won a stack of Grammy awards. He’s loved around the world. If that song “Lay Me Down” doesn’t turn your soul to jelly, your soul is non-existent. And he’s a hottie, even with an extra stone. Having him crow about your product is a valuable endorsement. According to an exclusive on TheWrap, HarperCollins, the book’s publisher has rushed to get it to print to be sold in the US. The release date is TBA, but we’re sure it will be soon in order to strike while the iron is hot. On some level, of course a celebrity endorsement can be worth its weight in gold. But more than that, this is a celebrity testimonial, posted on Smith’s personal social media page. Not a positive comment in a commercial or on a company’s branding page. It’s a powerful statement from someone who is not just showing before and after photos, but detailing the process of sticking to the guidelines and feeling good about it. 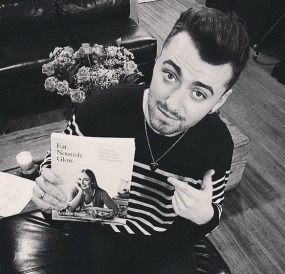 Thanks to Freer, there’s a little less Sam Smith for us to love.